**NOTE** Recipe can be made as overnight buns or can be made the same day within about three and a half hours (this time varies due to the nature of working with yeasted dough). 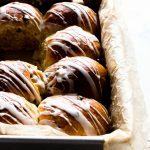 Fluffy, light and tender, Hot Cross Buns with Rum Soaked Currants are a treat anytime of year but make holidays feel extra special. Lemon and orange zest lightly scent these buns with highlights from cinnamon and a touch of cardamom. Line an 8x8 (20x20cm) baking pan with parchment paper, set aside. In a large mixing bowl, add the warmed milk and sprinkle yeast over the top. Whisk and set aside for 15 minutes to proof. It will be bubbly and frothy when ready. Meanwhile, in a small bowl, pour the rum over the currants/raisins, cover and warm for 30 seconds in the microwave. This will plump them up. Drain, pressing the currants/raisins through a fine strainer just before using in the recipe. To the frothy milk/yeast mixture add 2 eggs, melted butter, vanilla extract and maple syrup. Whisk throughly. To the wet ingredients, add the flour, cardamom, cinnamon and sea salt. Use a wooden spoon to mix first, then as the ingredients come together mix by hand until there are no dry patches. Add the lemon and orange zest and the drained currants/raisins. Using one hand, gently lift and press the dough over and onto itself while rotating the bowl in quarter turns with each fold with the other hand. Do this for about one minute to throughly fold in the zest and currants/raisins. Turn the dough out onto a floured work surface. Knead the dough for about 9 minutes until the dough has a tacky, not sticky, feel to it. If it's sticking to your hands, dust the dough with flour and continue kneading. Roll into a ball by tucking the edges in underneath the ball. Place in a lightly greased clean bowl, cover with plastic wrap and place in a warm location to rise (see tip in notes) to double in size. Turn dough out onto a lightly floured work surface. Gently roll the dough into a log and divide into 12 equal pieces (about 74g ea). Roll each piece into a ball and place into the parchment lined baking pan. Cover the buns with plastic wrap. (see options A and B for finishing the buns). A. OVERNIGHT BUNS: Place the buns in the refrigerator overnight (8-9 hours). In the morning, remove them from the refrigerator and allow buns to rise until almost doubled in size. When ready, they should be squishing against one another. Use the TIP in the notes to speed this process along (my overnight buns take about two hours to proof after removing them from the refrigerator using the oven proof method). B. SAME DAY BUNS: Set buns in warm spot to rise (proof) until almost doubled in size. When ready, they should be squishing against one another. Use the TIP in the notes to speed this process along. (my same day buns take about one hour to proof using the oven proof method). If using the oven to proof your buns, remove the buns from the oven before preheating the oven. Preheat the oven to 375F (190C). Crack the remaining egg into a bowl and whisk with one Tbs of water. Brush the tops of the buns with egg wash and bake for 23-25 minutes (or an internal bun temperature of 190F/87C). The tops will be golden. Allow to cool 5-10 minutes before adding the drizzle. In a small bowl, whisk together the sugar, milk or orange juice and cinnamon. If it's clumpy, keep whisking until smooth. If holding for more than 10 minutes place plastic wrap right on the surface of the mixture, otherwise it will dry out and start flaking. After the buns cool for about 5-10 minutes, use the tines of a fork to drizzle the mixture over the buns. Or, for a more traditional look, pour the mixture into a Ziplock, snip a hole in the corner or use a piping bag and pipe a cross over each bun. Store buns, covered at room temperature for up to two days. They are best right out of the oven. Rewarm buns in a 325F (162C) oven for about 10-12 minutes (the sugar drizzle will get flakey if rewarming). *I use Red Star Quick Rise Yeast. According to The Kitchen, you can use Quick Rise Yeast or Instant Yeast interchangeably. **Currants are smaller than raisins and I prefer them in sweet buns. But they can be hard to find. Look for currants in the bulk bins or simply use raisins instead of currants in this recipe. ***Use water in place of rum to make these alcohol free. TIP: Since kitchen temperatures vary, and in order to allow the buns to rise in a timely manner, you can use your oven to help control this process especially if your kitchen is on the cooler side. Simply turn on your oven at the lowest setting for about 30 seconds, then turn it off. The oven shouldn't be more than 100F. Place the covered dough into the oven. This will help the dough rise a bit quicker. This technique can be done for the first (fermentation) and second rise (proof).